As the White House press corps gathered in the residence’s driveway, they can hardly have expected the statement that South Korea’s National Security Advisor would give. Rather, they must have anticipated another functional diplomatic statement, to be followed by the typical analysis of the chosen language. Were the talks between South Korean and North Korean representatives ‘sufficient’ or ‘satisfactory? Was ‘progress’ made or was it ‘contingent’ on future discussions? Such statements are designed to give little away and leave reporters and observers meditating on single words or phrases. Instead, the South Korean official announced that North Korea had committed to denuclearisation and that President Donald Trump has accepted Kim Jon-Un’s invitation to meet face-to-face. A meeting would be a historic first as no sitting U.S President has ever met a North Korean leader. The three most recent U.S President, Obama, Bush Jr and Clinton, all received invitations but turned them down. A Trump-Kim summit is an enormous diplomatic gamble and until its announcement seemed unlikely. Much of the credit for the apparent breakthrough must go to South Korea’s President Moon Jae-in. Moon has only been in office for ten months since succeeding Park Geun-Hye who was impeached for her role in a corruption scandal. Since taking office Moon has advocated “anytime, anywhere” diplomacy with Pyongyang. It is an approach he is familiar with having served as Chief of Staff to President Roh Moo-hyun between 2003 and 2008 while Roh pursued the ‘sunshine policy’ of dialogue and aid provision with North Korea. Moon’s efforts to cool tensions on the Korean peninsula during the early months of his premiership collided with President Trump’s increasingly aggressive rhetoric. In September Trump accused Moon of ‘appeasement’, the same month that Trump threatened to ‘totally destroy’ North Korea during an address at the United Nations. Moon’s overtures, however, led to talks in the run-up to the Pyeongchang Winter Olympics which facilitated North and South Korean participants marching under a united flag at the games. Kim ultimately sent a high-level delegation to the Winter Olympics, including his sister Kim Yo Jong. Kim Yo Jong invited President Moon to attend the first inter-Korean summit in more than a decade, at which Moon urged North Korean representatives to reach out to the United States if talks between North and South were to progress meaningfully. This behind the scene diplomacy is believed to have encouraged Kim to make his invitation to Trump. In a second hand message, originally delivered to South Korean diplomats at a dinner in North Korea and relayed to U.S officials by those South Korean diplomats, Kim is alleged to have made a commitment to denuclearisation, agreed to a weapons testing ban whilst talks are ongoing and accepted joint military operations between the United States and South Korea. As much as the invitation appears a welcome change from escalating rhetoric between the U.S and North Korea, Trump’s acceptance has been greeted by two diverging views. On the one hand, some are spinning Kim’s alleged commitments and Trump’s willingness to meet face-to-face as a vindication of sanctions placed on North Korea. A pressure campaign of economic sanctions and military threats have pushed Kim into a corner and he has realized that talks are his only way out, possibly pressured by the Chinese to engage. This perspective views the talks as a genuine starting point to the denuclearisation of North Korea and the beginning of a less hostile situation on the Korean peninsula. The view to the contrary is that after forty years of developing a nuclear program, it is unlikely that Kim has suddenly, and unilaterally, decided to denuclearise. There is a great deal to be skeptical about given the commitment to denuclearise has not been made publicly by a North Korean representative, but only provided to South Korean diplomats privately. With North Korea’s record of reneging on deals and commitments, it is felt that there is little assurance the claims will materialise. More so, several analysts have pointed out how Trump’s agreement to meet Kim vindicates the North Korean strategy to pursue nuclear weapons. Having demonstrated the ability to strike the United States with ICBM’s and to develop nuclear weaponry, Kim may have succeeded where his predecessors failed in forcing a U.S President to the table. In this view, denuclearisation is a fantasy outcome, with the real intent of North Korea to get a face-to-face meeting with the U.S President that has been a top policy goal of the regime since Kim Jong-Il invited Bill Clinton more than twenty years ago. Such a meeting would allow the Kim regime to display to his population, and the world, that their pursuit of nuclear weapons has been an unqualified success and provided a meeting that would confer legitimacy to Kim as a recognised head of state and an equal. There is, in fact, a North Korean propaganda film “The Country I Saw” that literally ends with a U.S President compelled to visit Pyongyang by North Korea’s nuclear and missile program. To this end, Trump appears to have already frittered away a major diplomatic carrot – agreeing to give Kim the meeting he craves. Undoubtedly the meeting should play a role in negotiations, but it would be far more appropriate for the meeting to take place as the final act rather than an opening gambit. The diplomatic process has been totally upended. Usually months, if not years, of low-level agreement and choreographing lead to the symbolic meeting to confirm agreed terms. 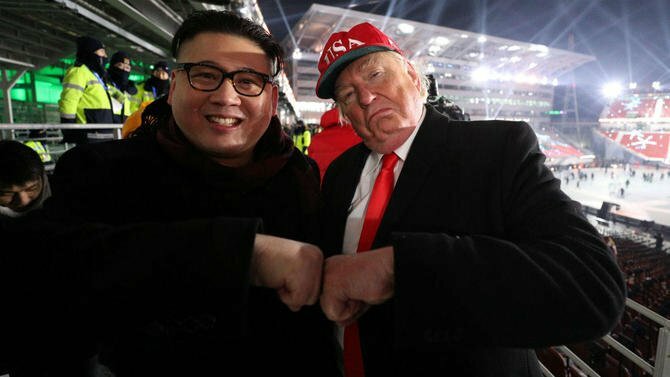 However Trump may just be giving Kim exactly what he wants, all the while Kim has no intention of meeting the concessions that he is believed to have made. Trump has also declared denuclearisation as the minimum acceptable outcome for the talks, making it much harder for him to accept a more modest but likely achievable deal. In combination with a meeting, should it take place first, the United States is left at a significant disadvantage, and under particular pressure is Trump’s self-proclaimed reputation as a dealmaker. In the short-term, the prospect of talks takes the sting out of a tense environment that risked stumbling into a serious conflict. As rhetoric escalated there were concerns that misunderstanding or miscalculation would lead to the accidental outbreak of war and cause the deaths of hundreds of thousands of South Korean civilians. It also provides a boost to President Moon, whose policy of engagement has born at least superficial fruit, but while he can bring the United States and North Korea to the table Moon cannot force them into a deal. He faces numerous risks from the talks, including that failed talks leave the region closer to a military conflict than before, that concessions by President Trump damage South Korean security or that a sudden reversal by North Korea follows its de facto recognition as a nuclear state. For the United States, the hard work starts now. The sense of doom and gloom around the region has temporarily lifted but a number of American politicians have in recent weeks expressed their willingness to fight the war, regardless of the costs to South Korea. This has undermined the alliance between the United States and South Korea and, understandably, made politicians in Japan nervous. The U.S will have to keep both South Korea and Japan intimately involved in its strategising and make public commitments and reassurances to them during any negotiation. The U.S must also avoid the perception that if the talks fail or break down, on whatever issue, that it is somehow because they have been the unreasonable party. In the diplomatic offices of nations around the world, many must also be speculating about whether the United States is presently able to successfully plan, engage and win a good deal with North Korea. The near total energy of the North Korea state will be mobilised for the talks, meanwhile, the U.S State Department is weaker than it has been in decades and there is still no U.S Ambassador to South Korea or Under-Secretary of State for Arms Control and International Security. The State Department must also now ‘catch up’ to the White House by preparing and making behind the scenes agreements with the North on specific policy areas and commitments before any meeting, in order to box in Kim. Without the aforementioned officials in place, it is difficult to see who may lead the negotiations. Secretary of State Tillerson doesn’t appear to have the confidence of the White House and questions will abound over the President’s ability to handle the talks personally. Already a brittle and narcissistic character the President doesn’t appear to have the temperament to handle diplomatic negotiations of this magnitude, given as they are too long, complex and compromised outcomes. On previous foreign trips, the President is alleged to have quickly become tired and bored of engaging with the work and these were mostly glad handing affairs. How will he fair in what is likely to be excruciating round the clock talks under enormous external pressure? Most fundamentally, there remains a question over whether the talks will actually take place. As has been outlined above, a historic meeting to begin negotiations favours only the North Koreans, but President Trump is no stranger to reversing an announced policy. Only days ago, a unilateral decision to place tariffs on all nations steel trade was announced, before a U-turn allowing allies to apply for exemption followed several days later. The Trump White House is a volatile and unpredictable policymaking environment, only further emphasised by the importance of South Korean diplomatic efforts to engage North Korea just as the United States undermines South Korean by placing tariffs on its steel.